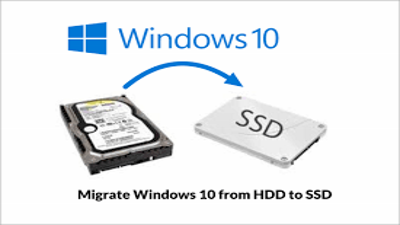 Moving Windows 10 to SSD can be done in a number of ways. If your PC is having speed issues, acting sluggish and struggling to run multiple apps, a good way to boost speed is to move your Windows 10 operating system to an SSD. This is not a quick task and shouldn't be performed without knowing exactly what to do. Before you attempt to move Windows to SSD you should backup the data on your machine. It's unlikely that you'll lose any information, however, just in case, a full backup is advised. Next, you'll need to do is check size of the hard drive that you've currently got in your PC. The best way to do this is to check the amount of space currently being used, so you don't end up purchasing a USB that is much larger than you need. Now you know how much space you'll need, you'll need to buy an external USB drive that is equal to or greater than the size you need. Depending on how much space you need, you should be able to pick one up for between $65 and $325. To get things started you'll need to go to the recovery program inside Windows 10. From there you'll be able to see an option to 'create backup image' or 'create backup ISO'. If you select create backup image, from there, you'll need to plug in the external USB hard drive and tell it to create a backup. This usually takes 1-2 hours to copy over. Using a USB provides a good method of extracting your Windows OS because everything on there will be installed, including all apps and preferences. So, when you install Windows onto SSD from your USB it will be like a carbon copy of your previous operating system. Once its finished you'll need to remove your old hard drive and plug the new SSD in.